Students those who are waiting for the publication of result can download the same from SBTE, Bihar’s official website by logging with the roll number. If you are also looking for the SBTE Bihar polytechnic diploma result of odd semester exams 2018-19 then you have to wait for just a couple of days. In the given article, you will get detailed information about the SBTE Bihar Diploma 1st, 3rd, & 5th Odd sem 2018 result. It includes information regarding result publication dates, online procedure to check result, the information mentioned on online result sheet and some important tips. Click here to check SBTE Bihar odd semester 2018 result – Other Result link to be updated soon. Students enrolled in various polytechnic institutes of Bihar will be able to check the only through the online mode. Firstly, university students are required to visit the official portal of SBTE. In the second step, candidates have to hit the “Exam Result” option provided on the left side of the homepage of the website. After clicking the “exam result” button, result page will open on the screen. Students have to select the exam and have to enter the roll number and have to click on “Go” option. Students must ensure that they have entered the correct roll number. They can use admit card for reference at the time of checking the result. After the entering the login credentials correctly, the result will appear on the screen. Students can now check the online result sheet displaying on their screens. Lastly, students can save and take a printout of their result for future reference. However, it is optional. Odd semester SBTE Bihar Diploma Result will be published online that will basically indicate the marks and result of the students enrolled in the various affiliated instituted and colleges. Apart from this, online result sheet will also include information of the student and examination. You can also have a look at some of the important points of SBTE Bihar Results for odd semesters. 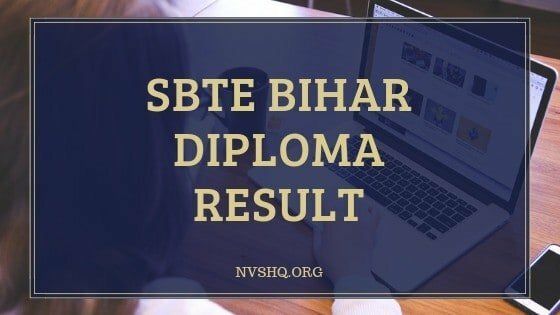 SBTE Bihar Diploma Result is expected to release in the month of February 2019. Board will declare the result only on its official website. No other mode is applicable. Students not able to pass a subject can appear in the compartmental/ supplementary exams after the declaration of online result. In order to appear in the compartmental exams, students are required to apply for the exam within the stipulated time. After the publication of online result, Board also declares the list of toppers for each semester. State Board of Technical Education, Bihar is one of the education board of Bihar that caters to the technical education in the state. There are 34 Govt Polytechnic institutes of the state permanently affiliated with the board. Apart from this SBTE has two part-time diploma affiliated institutes and 30 provisionally affiliated private polytechnic institutes in Bihar. Board performs various functions such as preparing exam schedule, the conduct of semester exams in all the institutes and colleges, evaluation, the announcement of results etc. In case of any problem related to SBTE, Bihar odd semester results, you can freely contact the Board’s officials for immediate redressal of the problem. You can also write to us through the comment box provided at the end of this article for all the latest updates and news related to the Odd semester polytechnic diploma result. Sir, gp Chapra internal marks zero veja.jis Karan fail dikhta rha h.age kya kare sir 3rd semester h plzzz.koi bhai log v batna kya kare. Congratulations sir, thank you sir for sbte result realesed. Confirm date nhi aai h abhi koi. Sir result aaj aayega kya??? Result to aa chuka hai aap check kar lo. Sir first semester ka result kb aayega as today it is 27th of march . Please sir aj result de dijiye n Sir… Mujhe amin ka form bharna hai… Please…..
Last week hi chal rha hai. kb aayega result sir, Please, give me answer about result. Result kb tk aayega.kitna din tk wait karte rahe…. Result is month k last tk aane ki ummid h.
Apki asuvidha k liye hume khed hai. Sir 3rd sem ka result kab tak aayega??? Sir,when declared the sem1 result.please say date. Aane vala h. Wait kare. Sir site pe March ke last week tk aayega kya….agar March ke last week tk aayega to…mai bihar lrc ka form nhi bhar skte n sir. Us se pahle hi aa jaiga. Sir odd sem ka result kb tk aa sakta hai plzz… bataenge ?